123 City MPG with the FIT EV! 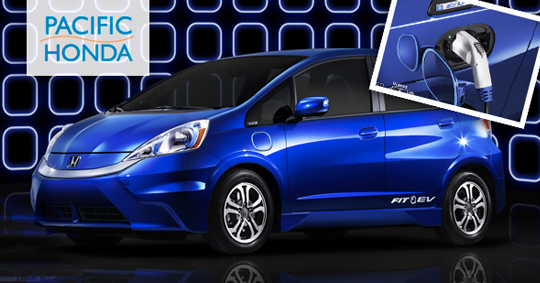 The Fit EV will be available for lease in select California and Oregon markets next summer and is expected to expand to six East Coast markets in early 2013. MSRP is $36, 625 with a monthly lease payment around $399. Sweet! We will keep you informed of any updates and developments here or at PacificHonda.com! See more pics & video here. We are SO excited to have teamed with with Rady Children's Hospital here in San Diego to help raise funds for kids in our community through their Holiday of Miracles event. Wondering how to participate? Drop off a new unwrapped gift at our store or donate here! Every little bit counts. Happy Holidays!! We're doing Black Friday, and we're doing it BIG! Beat the crowds and get yourself in this weekend (3 days only - Nov 25 through 27th) to see what we're talking about. No reasonable offer will be refused. Excellent lease and financing options, as always. And a FRESH selection of New & Certified Pre-Owned Hondas. You have better things to do this holiday season, than to drive around and compare prices, that's why we've done that work for you. But first things first... enjoy your Thanksgiving, Everyone! 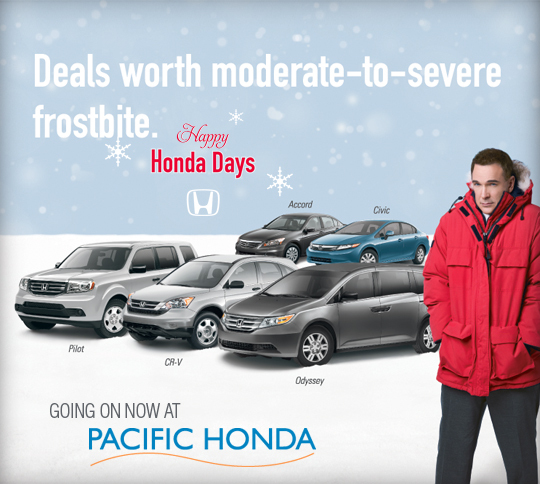 Happy Honda Days at Pacific Honda! Yup, it's that time again... 'tis the season for HAPPY HONDA DAYS! 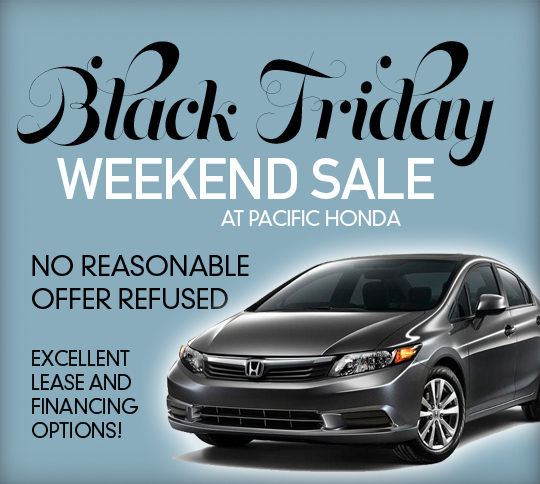 Which means, it's time for you to gift yourself an amazing deal on a New or Certified Pre-Owned Honda at Pacific Honda. We've posted just a few of the deals of the season on our website - check them out!